In 2016 general elections, Massachusetts voters extended a record of support for progressive causes and candidates. Voters strongly supported Clinton and Kaine for President and Vice President, and they returned a delegation of mostly progressive Democrats to Congress. On four statewide ballot questions, voters opposed another slot-machine casino, opposed lifting limits on charter schools, favored protective measures for farm animals and annulled former state laws against marijuana use and sale. Votes for President and Vice President: Hillary Clinton and Tim Kaine won majorities in 257 Massachusetts cities and towns, losing in 94 of them. Populations in the cities and towns that Clinton won ranged up to 618 thousand (Boston), averaging 22 thousand. Populations in the cities and towns that she lost ranged up to 41 thousand (Westfield), averaging 10 thousand. Opposition came mostly from small towns. The ten communities with the strongest opposition were Blandford, Chester, Douglas, East Brookfield, Granville, Holland, North Brookfield, Russell, Southwick and Tolland–all with populations of less than 10 thousand. Contrary to speculation that higher-income communities were more likely to support Clinton and Kaine, the votes of Massachusetts communities did not show a clear trend of that type. Instead, communities with larger populations voted more strongly for Clinton and Kaine. 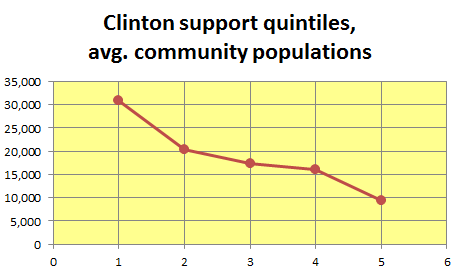 When Massachusetts communities were divided into quintiles according to support for Clinton, with quintile 1 the strongest support, there was a clear, uniform trend of increasing support with increasing community population. Votes on charter schools: Sponsors of Question 2, trying to abolish limits on charter schools, spent $24 million. At around $20 for every vote they attracted, it was by far the most costly campaign ever on a ballot question. They won majorities in only 15 of the 351 Massachusetts cities and towns. Adams, Boston (27), Cambridge (3), Chelsea (2), Chicopee, Devens, Easthampton, Everett, Fall River (3), Fitchburg, Foxborough, Framingham, Franklin, Greenfield, Hadley, Harwich, Haverhill, Holyoke (2), Hyannis (2), Lawrence (8), Lowell (3), Lynn, Marblehead, Marlborough, New Bedford (3), Newburyport, Norwell, Plymouth (2), Salem, Saugus, Somerville (2), South Hadley, Springfield (6), Tyngsboro, West Tisbury and Worcester (2). No Massachusetts community that has a charter school supported Question 2. No city in the state and no town with a population over 28 thousand supported Question 2. 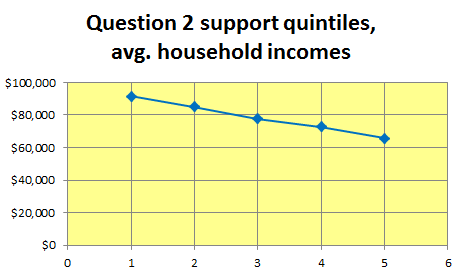 Instead, high household incomes correlated with support for Question 2. When Massachusetts communities were divided into quintiles according to support for Question 2, with quintile 1 the strongest support, there was a clear, uniform trend of increasing support with increasing household income. The ten communities voting the strongest support for Question 2 were Aquinnah (on Martha’s Vineyard), Chilmark, Dover, Gosnold, Lincoln, Manchester-by-the-Sea, Nantucket, Sherborn, Wellesley and Weston. They include four of the six highest-income Massachusetts towns: Sherborn, Wellesley, Carlisle, Sudbury, Dover and Weston. None of the Massachusetts communities that supported Question 2 has a charter school. Meanings of trends: Measured trends of support for Clinton and for Question 2 run cross-current to some popular political lore. In a graphical analysis, New York Times writers speculated that lower-income voters turned against Clinton, while higher-income voters did the reverse. Results from Massachusetts communities show no clear trend connected with incomes but instead show a trend involving sizes of the communities where voters live. The more urbanized voters tended to support Clinton. In contrast, results for Question 2 from Massachusetts communities do show a clear trend connected with household incomes. Sponsors of Question 2 and their apologists claimed that the charter schools are hugely popular with low-income households. If that were true, then there might have been a trend linking stronger support for Question 2 with lower household incomes. However, the actual trend from Massachusetts communities went in the opposite direction. Promotions for Question 2 appeared to have sophisticated authors, but perhaps the sponsors of Question 2 fooled themselves about the appeal of their products. Bystanders in communities hosting charter schools are much more numerous than participants–a factor that sponsors of Question 2 might not have weighed accurately. This entry was posted in Business, Elections, Grade schools, History, Regulations, Services on December 22, 2016 by Craig Bolon.